This year has certainly had its ups and downs and it seems like more downs than ups at the moment. My face has changed from smiles to frowns as I walk round the garden. So this is the first post in a series (on alternate days) of how the garden can make you feel; starting with anticipation. Its been a long journey. The peach flowers opened and every other day we hand pollinated the flowers. The flowers set and there was a mass of small fruits. We thinned them out, discarding about 75%. The peaches swelled. The new growth was attacked by red spider mite so I have been hosing down the plants at least three times a day and have halted their progress. 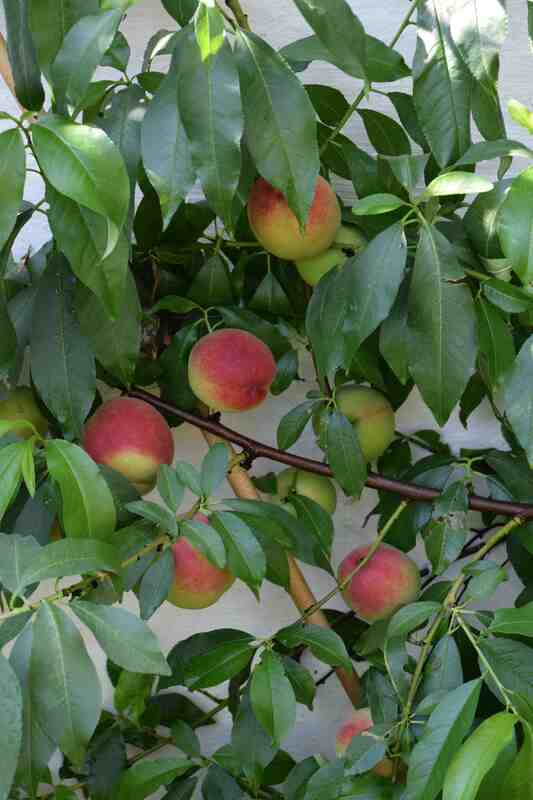 And now the peaches are swelling and blushing where the sun touches them. They are still hard but are looking more ripe every day. Anticipation. oooooooooo lovely mine are outside so not quite up to yours yet. Well as long as you have some 🙂 We missed the storms last night – we could do with some rain – but i see that you had a good soaking! Wow, those are beautiful peaches! And some great dedication.